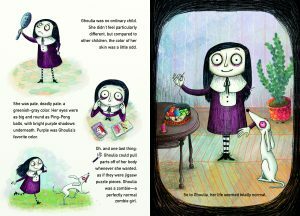 Interior artwork from Ghoulia by Barbara Cantini, Abrams/Amulet Books ©2018. 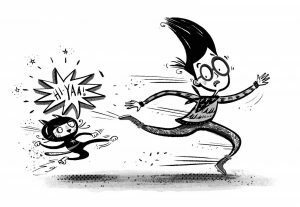 Spot art from Sam Wu is NOT Afraid of Ghosts by Katie and Kevin Tsang with illustrations by Nathan Reed, Sterling Children’s Books ©2018. 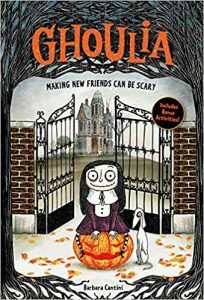 Chapter book, Sam Wu is NOT Afraid of Ghosts is a good match for reluctant readers because of its simple text, frequent illustrations, and funny asides in the margins or footnotes. As the title implies, there will be a lot of ironic humor; Sam Wu must face his fear of ghosts and reestablish himself in the eyes of his peers after a truly embarrassing incident. Luckily he’s learned a lot from his favorite TV program, “Space Blasters.” Now it seems there’s a ghost in Sam’s house, so Sam and his friends must prove they are brave ghost hunters. Kids can sympathize with how it feels to not fit in. Sam introduces his friends to his favorite meal (roast duck and turnip cake) and urges them to take just one bite—even though the turnip cake does smell a lot like feet. 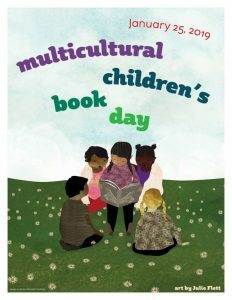 Doing so, he successfully bridges their cultures using delicious food. 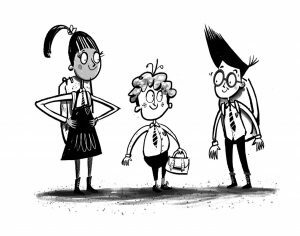 Regaining some dignity with his classmates is harder, but Sam Wu demonstrates he’s no “Wu-ser” (as Ralph, the class bully, calls him). Nathan Reed livens up the story with hilarious images of the characters including the evil cat Butterbutt, and Fang, the toughest snake ever. 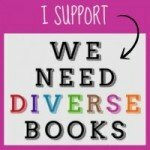 There is visual interest on every page to keep kids engaged beyond the text of the story. 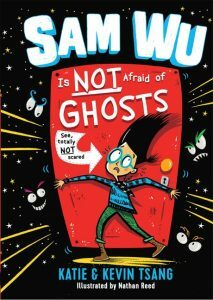 Sam Wu is NOT Afraid of Ghosts works well as a Halloween book for kids who prefer not-very-scary ghost stories with plenty of laughs. 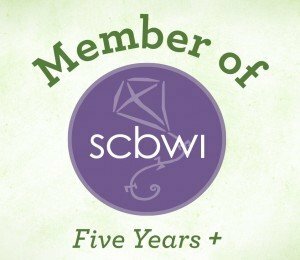 Looking for a spooky Halloween read? 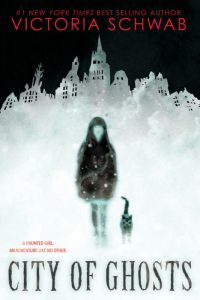 Check out Victoria Schwab’s middle-grade novel, City of Ghosts. 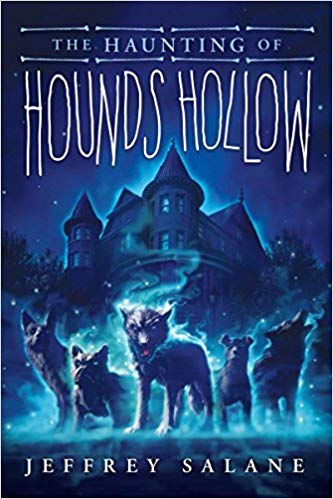 The story opens when eleven-year-old Cassidy’s birthday gift sends her over the edge (literally) and she drowns (sort of—a boy-ghost named Jacob retrieves her from death). Soon after, Cass is drawn toward something she calls The Veil and discovers that she can cross over into the place where ghosts dwell. Jacob and Cass travel to Scotland with Cass’s parents whose book The Inspecters (inspectors of specters) is being made into a television series. Cass meets another girl with the same sort of gift in Edinburgh, the city of ghosts. There, mysterious locales harbor dangerous inhabitants; Cass must quickly learn how to survive. The reveal-and-conceal relationship between the lead characters in City of Ghosts is fascinating. There’s a lot to learn about the other side when adventures through The Veil become more complex. 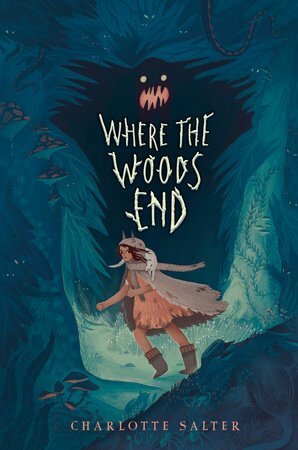 This book explores historical haunts and interesting folklore as the alluring story unfolds in ethereal delight.